Backpacking footwear has come a long way from the burly leather boots of your grandparent’s generation. Now you can choose from everything from supportive waterproof boots that are a fraction of the weight of yesteryear, to low-top hiking shoes, to ultralight trail runners for those who want to cover serious ground (and have strong ankles). There is no single “best” type of backpacking footwear, so below we break down all of the tips and information that you need to make the right decision. From ankle support and upper materials to traction and toe protection, we’ve got your backpacking footwear questions covered. For years, hiking boots dominated the market and you would scarcely see backpackers wearing anything else. Burly, leather, tank-like hiking boots with thick soles that could take on all types of terrain (I bet you can picture the accompanying short shorts and external frame packs too). By 2016, however, backpacking footwear choices have become much more eclectic and you’ll find everything from boots to low-top hiking shoes and even trail runners. And it’s not just leather anymore: there are all kinds of lightweight synthetics in the mix that are still reasonably tough but lighter and more breathable. It’s a good time to be shopping for backpacking footwear. We are here to tell that boots still have a firm spot in our backpacking quiver. They offer the most support, protection, and now come in a variety of styles from lightweight to heavyweight. Trail runners and hiking shoes have their appropriate uses too. By going minimalist, you sacrifice some support and protection but gain a nimble and fast-moving transporter. Even midweight boots like the Salomon Quest 4D 2, an ideal choice for most backpacking trips, weigh nearly 3 pounds for the pair. Its younger hiking shoe cousin, the low-top Salomon X Ultra 2, weighs a full pound less. Inevitably, you will feel that difference. It may come at mile 3 or mile 10, but it’ll come. In an ideal world, you’d have both a boot and a light and flexible shoe, and choose depending on the specifics of the trip and conditions. But that’s not a reality for most folks. Our general advice is as follows: Get hiking boots if you need the ankle support, your pack is heavy, or the terrain is dicey. We tried using hiking shoes on a long backpacking trip with a heavy pack and it just didn’t work out. Get hiking shoes if you like moderate stiffness and stability underfoot but still want to keep your ankles free and feet feeling light. Hiking shoes can work well with a medium to light pack and when the terrain doesn’t promote ankle rolling. Get trail-running shoes if you really prioritize low weight, flexibility, and you move fast and cover long distances, preferably with a smaller pack. We’re looking at you young fast packers with rubber Achilles who don’t know better. As with high-top hiking boots, for years waterproof liners were the norm and it was tough to find backpacking footwear without them. That often led to hot, sweaty and wrinkly feet every night at camp, making outdoorsy folks question the merits of a waterproof and (barely) breathable design during the summer. Hence the growth in popularity of mesh-heavy, non-waterproof boots and shoes. For most folks, waterproofing still is a no-brainer for backpacking. Conditions can change rapidly no matter the forecast, and being a long way from your car is reason enough for most to turn to the security of Gore-Tex. That said, we are proponents of summertime hiking in non-waterproof shoes for one major reason: breathability. Waterproof shoes are intended to keep water out, which also means they’ll inevitably retain some moisture in the shoe—and in most cases this means your sweat. Also, should you step in a creek and get water in your shoes, a mesh-heavy design will drain and dry out relatively quickly (much faster than a waterproof one). Should you opt for waterproofing, this typically means a waterproof and breathable bootie between the outer material and the inner lining. Gore-Tex makes the most common type of waterproof liner and their familiar label is found on pretty much all mid-range and high-end waterproof footwear with the occasional exception (including eVent and other proprietary technologies). 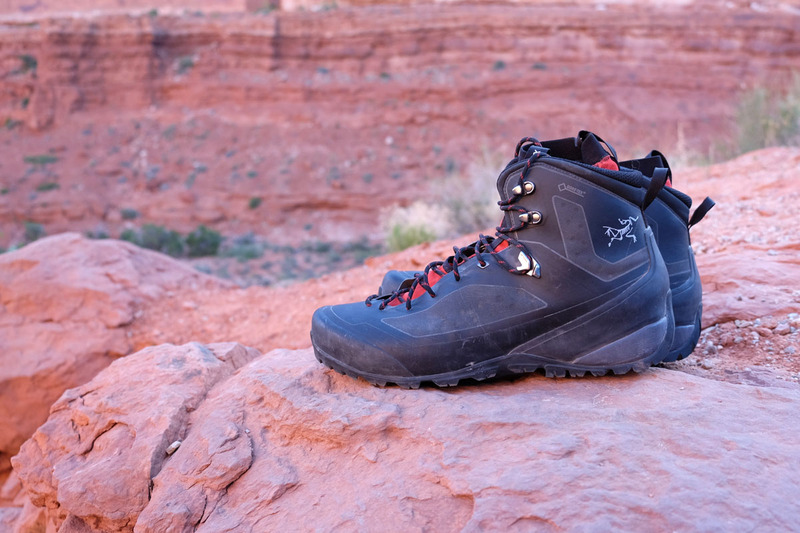 A couple of waterproof designs that standout from the rest are Gore-Tex’s new Surround technology and the two-piece construction found in the Arc’teryx footwear line, which puts the waterproof lining inside a separate, removable bootie (check out our review of the Arc’teryx Bora2 boots). Gore-Tex Surround was introduced in 2015 with the aim of giving 360-degrees of breathability in a fully waterproof design. It works by pushing hot air and moisture from the inside of the shoe through a permeable footbed and out the sides of the shoe. The effect on a synthetic mesh design like the La Sportiva Synthesis is an impressive one, albeit still falling short of a non-waterproof option, and we’ll be interested to see how well it works with a more traditional hiking boot. 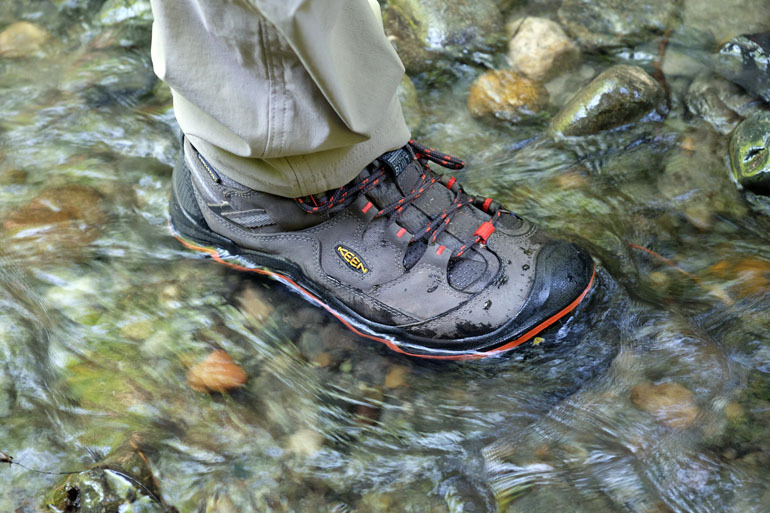 We love lightweight hiking shoes, but one of the downsides is the loss of lateral stability. It’s a problem just about everyone on our staff can relate to. From a backpacking trip in Patagonia made miserable by rolled ankles (David) to a tedious and ultimately unsuccessful scramble up a granite peak (myself), we can attest to the importance of ankle support in certain circumstances. As such, we’ve identified two instances where it’s worth the extra weight to go with an over-the-ankle boot: 1) If the terrain is rough and; 2) If your pack is heavy. By the very nature of the design, the lower ankle height of a shoe or trail runner will not offer nearly the same level of stability as even the lightest hiking boot. If you have weak ankles, get a boot. If the path is rocky and rough or if you’ll be venturing off-trail with a fully loaded pack, get a boot. Not to sound like a broken record—and an old one at that—but we’ve seen a significant shift in hiking footwear over the past 15 years. A significant part of that change came from the move to lightweight fabrics. Full-grain leather boots, the go-to choice for the non-internet generations, are heavy, stiff and require a decent amount of break-in time, which doesn’t appeal to a growing contingent of fast paced overnight and weekend backpackers. Hence the synthetic market has seen big growth. Nylon and mesh cut weight and are far more breathable than leather, making it easier to cover more miles. More, their flexible construction requires little to no break-in—perfect for the casual outdoorsperson. Thin nubuck leather is a common site on footwear to beef up the durability and water resistance, but at little cost to weight. Backpacking is now synonymous with being lightweight and minimalist, which is why we foresee these construction trends continuing, pushing the boundaries on light but still trail-worthy footwear. Getting down to the nuts and bolts (or in this case, plastic and foam) of hiking footwear is a little tedious, so hang on a moment. Your footwear midsoles, logically the area between the outsole (rubber) and insole, play a big part in trail comfort. Carrying a pack over a lot of miles is a recipe for sore, tired feet, which is why your shoes’ midsole is supportive and padded. There are two primary midsole types: EVA and TPU. EVA is essentially a kind of foam and quite common on lightweight shoes and boots. It weighs less than TPU and is soft and comfortable, but does wear down more quickly. TPU is a hard plastic that absorbs impacts well and doesn’t compress over time, which makes it a popular choice for serious backpacking footwear. In truth, we’ve been pleased with both types because the midsole material isn’t the only factor in the comfort and underfoot support. Keep it in mind for a general idea for how the shoe will feel and perform over the long haul, but consider the midsole type alongside other factors like the kind of support (shank) and underfoot plate to get the whole picture. Hiking trails and conditions vary dramatically, but a good pair of hiking footwear with formidable outsoles should serve you well in a range of environments. Take for example a few of our recent backpacking trips. Canyonlands National Park in Utah is dry slickrock and requires a good amount of scrambling. In contrast, the trails in the Central Cascades are wet, muddy and filled with mossy roots. Our various hiking shoes and boots performed just fine through it all. Tread depth and design are unique to brand and shoe model, but there are some helpful generalities. Hiking shoes and boots are known to have thick and deep lugs that perform well in mud and muck. Depending on the softness of the compound, they should also grip rock well. Trail runners, particularly serious race models, are known to have a form of braking system built into the tread design to give traction on steep descents. Their lugs are more spaced out, which sometimes leads to getting caked up in the mud and not gripping as well. Approach shoes, designed for climbers that need to hike into their climbing destination, are specialized to grip rock with a sticky compound and smoother tread design. Have you ever kicked a rock on the trail? Felt great, right? Black and blue toes look particularly classy in flip-flops, but hey, at least you still have your toenails (for now). Jokes aside, proper toe protection is one of the main reasons to upgrade to more serious hiking footwear. In a pair of well-constructed shoes or boots, you can deflect rocks and roots rather easily with a rubber toe cap. This amounts to a thick rubber rand that covers the front and sides of your feet. The thickness and acreage will vary by manufacturer and style, but we usually recommend putting proper toe protection high on your list. The exception is if you are hiking exclusively on a well-groomed trail that is free or rocks and other debris. Much like a toe cap, thin protective plates are slid underneath the forefoot to absorb impacts from pointy rocks and other trail debris. They’re a great way to toughen up an otherwise thin pair of trail runners and have been a difference maker for us on longer trail runs and backpacking trips. Despite its unfortunate name, a shoe or boot shank is in fact quite helpful in creating a rigid structure. Perhaps the only parallel with other, more lethal definition of shank is that a footwear variety is tucked away inside the shoe, between the midsole and rubber outsole (on the plus side, it will also stay there). On stiff boots, a full-length shank will be made of a stiffer material, like a hard plastic. We find them particularly helpful on long, alpine climbs, when a flexible boot is actually a bad thing. By keeping your heel from dropping, these stiffer boots help reduce calf fatigue. You won’t find a shank in most trail runners. Those instead emphasize a bendy and lightweight feel, and rely on very lightweight protective plates for structure and to ease the sting of landing on a rock. And on modern hiking shoes and boots, ¾ length nylon shanks are becoming popular as a compromise between support and flexibility. Take this as a little piece of advice for dialing in the fit, especially when looking at hiking boots. Even a perfectly fitting pair of boots can be spoiled by a bad lacing system that doesn’t keep your heel pinned in place. And a poorly fitting boot can absolutely tear up the back of your feet, effectively ruining a backpacking trip. We’ve all backpacked at some point with someone who has gotten blisters and torn up feet. It’s not fun for them or the rest of the party. For over-the-ankle style boots, look for locking hooks to help keep everything in place. On their trail runners and fastpacking shoes, Salomon and Adidas take a different approach with locking speed laces. The single-pull quick lace systems are easy to use, and in our experience, just as reliable (both traditional laces and speed laces do fail on occasion). The advantages are speed and convenience—easy on and easy off. On the flipside, they offer essentially zero customization of the fit. It’s a single pull and everything tucks in evenly around your foot, for better or for worse. If you find yourself needing to make those micro adjustments with your laces to get a comfortable fit, we recommend steering clear of these quick lace designs. It would be a darn shame to spend $100 to $200 or more on backpacking footwear and still not be comfortable. Good hiking socks may set you back $20 or so, but we are here to tell you that it’s well worth the investment. It’s also a good idea to spend $5 on Moleskin in case you didn’t break-in your boots properly and develop some blisters. With that trio in tow, you should be good to go. Merino wool, the glorious natural fiber that regulates temperature, wicks moisture and avoids stinking, is our go-to choice for backpacking. As for brands, for us in recent years, it’s become a one-horse race. Darn Tough overtook SmartWool and never looked back for a number of reasons, but one in particular: they don’t wear out. While other socks are collecting holes, our Darn Toughs show no signs of breakdown beyond the occasional pilling. There are a number of Darn Tough sock variations on the market, and we break down our favorites in our article on the best hiking socks. On the fringy side of things, some serious backpackers carry a waterproof sock as a supplement for waterproof hiking shoes. It’s an interesting idea for thru-hikers that wear mesh-heavy trail runners and need waterproof protection on occasion. For them, it's a heckuva lot easier to bring a couple pairs of socks than multiple shoes. Backpacking can be really hard on your body, and even overnight or weekend trips can lead to serious soreness and pain. Your backpack, essentially a rather heavy appendage stuck to your back, can throw off your balance and lead to complaints from your knees, hips and ankles. And it’s not just footwear in the comfort equation. For added support, we turn to a trusty friend: trekking poles. In our opinion, there are very few instances when these wonderful sticks aren’t a big help on a backpacking trip—no matter the distance. 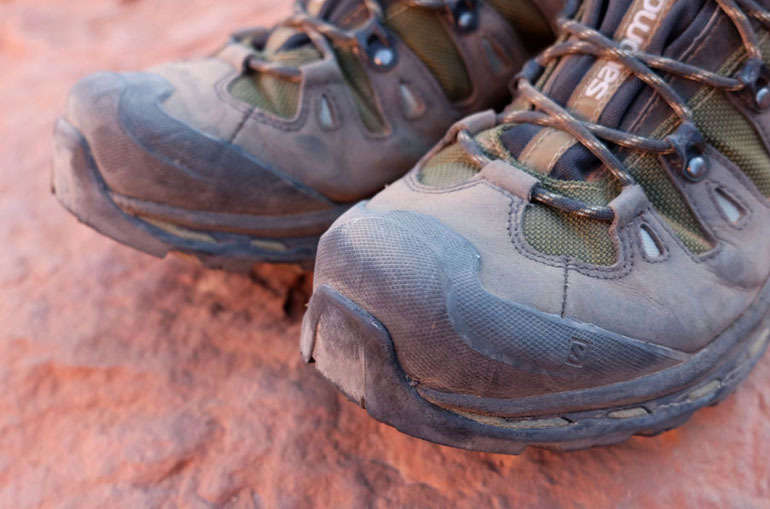 Backpacking footwear isn’t cheap and it’s an investment that most only want to make every handful of years As such, it’s worth taking note of a few ways you can extend your boot or shoe’s lifespan. Dirt, sand and grime can find their way into just about every crevasse and breakdown the upper fabrics over time. And the waterproof linings on shoes need to be free of impediments to be able to ventilate, so keep ‘em clean. This doesn’t mean you have to scrub your footwear after every trip—we sure don’t—but it’s not a bad idea to keep them reasonably clean and go through the washing process after a muddy expedition. Now that we think of it, given our home base in the wet and sloppy Pacific Northwest, we should probably go wash our boots and shoes right now! For a complete breakdown of cleaning tips and tricks, we recommend this hiking boot care article put together by REI. 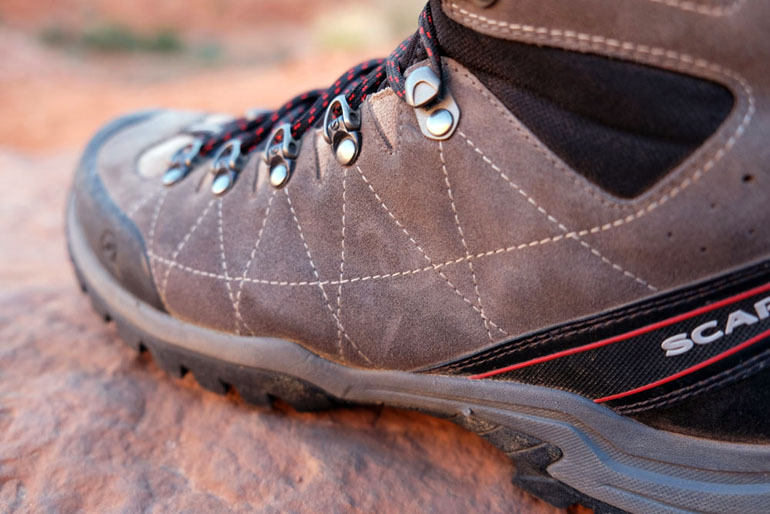 We’ve now told you just about everything you need to know about backpacking footwear. If you have an idea as to where you’re headed and want to look at specific models that will serve you best, see our articles on the best hiking boots, best hiking shoes, and best trail runners.